I have three sugar glider who all seem to be normal and healthy. They bicker with eachother and jump from place to place. They usually stay in their cage and my family and I give them attention every time we pass by them. My mother told me I could take one into my room as I am trying to bond with a female to keep when I move out. She was fine in my jacket pocket and when I took her out to see new things she happily obliged usually going to run through my clothes in my closet. I was pulling my beanie up to her that I hadn't worn in ages and I think my dog slept and chewed on it and she suddenly started shaking. She looked up and her head started to twitch and shake violently her grip was tight but I removed her paw from a piece of cloth and wrapped her back up in my jacket. A small amount of saliva bubbled from her mouth but it quickly went away. After the episode was done she kept shaking. About 10 to 20 minutes later she was fine and poking out every now and then to see what I was doing as I had been sewing a pouch for her to keep her stable while I clip her nails. She is terrified of my dog and I didn't realize that my dogs scent had lasted on the beanie. She has never had a seizure before and now she is acting like nothing happened. I'm going to take her to the vet but I want to know what could be happening. Could it have been stress? They usually just eat meal worms but I am going to get her on a much better diet than that, but could that be it? As I said this has never happened before and I noticed what it was right away. What do I do in that situation? All I could do was nuzzle her into my jacket until she was completely out of it and calm. Some seizures can be caused by overstimulation. Gliders are very sensitive to scent. The hat may have triggered this. If you click on the word diet, it will take you to a database of choices..
A gliders lifespan is up to 15 years in captivity. It's a good idea to get them on a good diet. Oh and Welcome to Gliders central! Getting her to the vet quickly for a checkup is really important, and you did all you could do in the situation. It is hard to know what brought on the seizure as it could be many things. How old is she and how long have you had her? Are they all the same age? Did they come from the same breeder/place? Dawn is correct about the diet. Gliders need a stable diet to include protein, veggies and fruit. Please click on the word diet where you see it highlighted in blue and that will take you to our database. There you can see the different choices. You can also cruise through our diet & Nutrition forum to read what other members are feeding. I am going to move your thread to our Health & Hygiene forum now. Please keep us updated. I agree with everything that Dawn and Karen told you. Seizures can be caused by many things. I have had a couple glider through the years. Some are caused by a sudden drop in blood sugar, got to excited when taken from the cage. My Gizmo was the one that had low blood sugar seizures getting her on a good diet ended those seizures. Panda would have a seizure from bright lights or loud noises. I had to quit taking her out of her cage. Hopefully, it was a one-time thing for your furball, but as everyone has said the check-up is good. One of my boys has stress/excitability seizures, so I am able to emphasize with how difficult it is to watch and how unpredictable it can be. Not sure if there is much I can offer, but if you have more questions after the vet visit, feel free to ask through a post or you're welcome to PM me if you prefer. I checked her up in the vet she is fine. She hasn't has a siezure since yesterday and she is perfectly normal and energetic. I bought her some food it should be on it's way along with some treats a big cage and a little carrier pouch. Thank you all for the helpful advice. My lovely ladies name is Polly Pocket. All three of our babies came from the same place but I wasn't informed on how old they were. I plan to actually make an appointment with the vet to see where she is age wise and how she's doing other than the seizure. Just have to pay the vet bill. I checked her up in the vet she is fine. She hasn't has a siezure since yesterday and she is perfectly normal and energetic. Good to hear her checkup went well. Just keep an eye on her for anymore seizures. I bought her some food it should be on it's way along with some treats a big cage and a little carrier pouch. Thank you all for the helpful advice. My lovely ladies name is Polly Pocket. Would you mind telling us what you ordered and from where. Just curious. All three of our babies came from the same place but I wasn't informed on how old they were. I plan to actually make an appointment with the vet to see where she is age wise and how she's doing other than the seizure. it is usually difficult to determine age for sure. Maybe you could post a picture of all three for us. Just have to pay the vet bill. What diet did you order online? Critterlove is a great diet for sugar gliders. 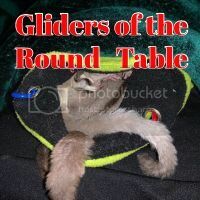 It isn't hard to do and feeding with the recommended salad mixtures is a balanced diet for sugar gliders. Please do not get confused with Exotic Nutrition's "Instant HPW", Instant HPW has been tested by a private party and what is in the bag is no where near what is on the label for this food and it was tested twice. I would steer clear of this diet. If you click on the word diet, it will take you to the data base with most of the diets out there on it. I personally recommend the Critterlove. To add to Feather's comment, you are changing all three gliders to another diet? Not just the one? Another issue you may be having with the female is stress. She may be missing her cagemates. Have you considered carrying the colony in a bonding pouch? She might be missing her mates. Gliders usually do better in colonies than single. Especially if they are already accustomed to being with others of their own kind.